Let me preface by stating that this post relates more specifically to using houseplants as a tool for health and healing related to mental/emotional imbalances, grief, stress, and overall self-care. This blog post will not delve into using plants physically as medicines or as remedies (although there is, of course, tons of information to be found related to this topic). Let’s be honest and just state the truth that too often life doesn’t feel easy or “good” – it feels stressful and demanding, confusing, seemingly chaotic and at times even observably cruel. The stressors of our current society are deep, constant and rooted in fear; often weighing heavily upon us physically, mentally and spiritually as well. Yet there is an incredible sense of acceptance, peace and even HEALING that can be attained through our relationship with Nature and connections to our house plants specifically. As I reflect upon it, I realize that my journey with succulents and plants began and continues to be for me personally, a sacred space of both healing and awareness. One year after the birth of my second child, I found myself lost down a pit of fear, anxiety, insecurity, and self-judgment. I couldn’t sleep, eat, carry on a conversation not related to my fears, or take joy in the major blessings that were, in reality, my life. I got some much-needed help (you can read more about my story with anxiety HERE) and found time to get outside to play with my succulents. I soon realized that the constant chatter and “fear talk” occupying my mind went silent when I was creating with plants. I was present, and aware and connected and in FLOW. Slowly but surely that feeling filled me back up with a sense of self, purpose, and spirit and soon after INFINITE SUCCULENT was born. 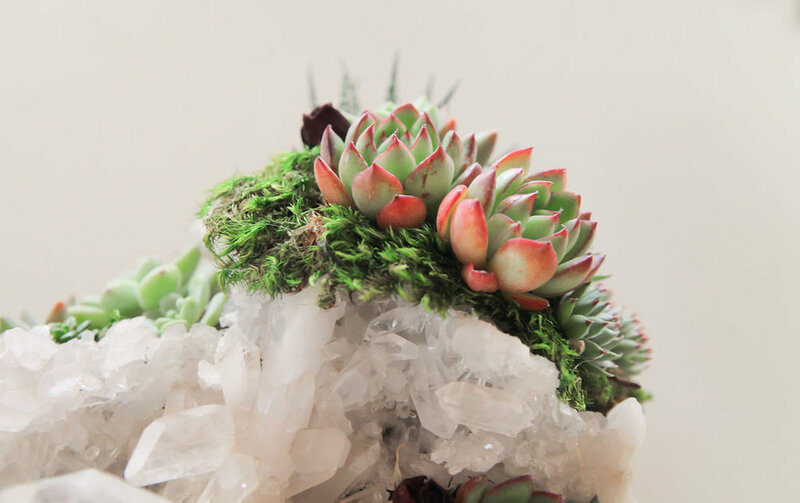 Through Infinite Succulent, I use my art and styling services, along with my writings, to connect others with the creative and healing power of plants and Nature. Interestingly, I found myself needing those healing powers again over these last two years of political ugliness and the stress of running my own business, constantly chasing after one unattainable version of success after another. This time I found myself deep in self-judgment, comparison and feeling like I will never be “insert anything here” enough. My plants were still there, still growing and thriving even with my more haphazard care – patiently waiting for me to be still enough to again listen to their lessons. I created when I needed to create, for clients and editorial jobs, but something was missing, and I found myself filled with doubts. Finally, I could no longer handle the negative self-talk that left me feeling defeated and “less-than” even amongst some of my greatest professional wins. And so, I committed myself back to my Self – back to working on my own personal growth and recommitting to my higher purpose which is sharing the connection we all have with Nature. I discovered that tending to my plants with mindful presence, along with creating art focused with intentions, lead me to some places of very powerful healing and acceptance. One major lesson the plants have helped me realize is to have patience and presence, for the healing comes from the journey itself. For example, when I find myself overwhelmed by daily tasks - kids’ schedules, goal setting, meal planning, lack of planning, content writing, finances, social injustice, destruction of our planet… (shall I go on? The list is never ending) - I often turn to my plants for comfort. The way I care for them becomes an exercise in mindfulness – a moving meditation of sorts. I search for new growth, I test the soil of each plant, assessing who might need to be watered, and who just misted (houseplants only – not succulents! ); I prop up and shape climbing vines, prune back dead foliage, lovingly wipe their leaves of accumulated dust, and photograph them in all their present glory. And through this relationship with my plants, I find Peace, even if for just within those moments. Being Mindful and fully Present. Seeing the beauty of Life that surrounds us, as it is, right now. Accepting life as it is right now. Seeing and feeling the wonder, majesty, and magic in everyday occurrences like the unfurling of a new leaf or bloom. Feeling a deep and extremely personal connection to Nature and therefore to all of Existence. For me, working intimately with plants (and Nature) has gifted me numerous opportunities to heal, grow and always seek more learning. What I find fascinating, and yet also so obvious, is that so many others have experienced the same healing effects of working with plants and connecting with Nature. In fact, a study in the journal Science back in 1984 found that patients recovering from gallbladder surgery in rooms with views of a tree healed faster and with less need of pain medication than those healing in rooms with views of other buildings (Source). Enhance the activity of same NK cells – which can last for hours to days after the forest bathing experience depending on how much time was spent in the experience. Elevate the number of anticancer proteins within your immune system, which act to both prevent cancer and fight off tumors should cancer emerge. The science behind why trees and plants are able to stimulate our immune system in this way will have to be a subject for another day, but let me leave you with a hint: it is tied into the science of how and why essential oils are able to provide health benefits often through smell alone. A few months ago I reached out to you, my followers and friends. I asked you all, via an Instagram Question, if plants had ever helped you heal personally and the results were overwhelming. You shared stories of depression and suicidal thoughts, loss, cancer, recovery, self-sabotage and grief. Your stories were real, raw, filled with pain and yet also incredibly hopeful for you all shared the same source of comfort and healing – your personal relationship with your house plants and with nature. You spoke of the connection the plants brought to you at times when you felt so alone, isolated in grief and emotional suffering. Through working with your plants, and appreciating Nature, you felt a return to connection – return to care, return to the love for and from loved ones who have passed, return to true living and return to yourself. Until then friends, I wish you many occasions to welcome in the soothing and healing experiences available through your houseplants, gardens and daily experiences in Nature - body, mind, and soul.